Datacentre Dynamics took place this week at the London Excel. The exhibition is a key November event in the UK datacentre diary and draws solutions suppliers and professionals from across the UK and Europe. Education is a key part of the exhibition which features industry leading keynotes, seminars and occasionally the launch of new product and service innovations. At the show this year, Riello UPS (one of our main specialist UPS suppliers) launched a new compact generating set called the ‘Power Cube’. Manufactured by Himoinsa Power, the generating set could well be a game changer in the critical power and standby backup market place. At 500kW within a 10foot square footprint (that’s 50kW of power per square foot), this new generator provides a very high power density. At this level of compactness it is more easily transportable than a traditional standby generator; ideal for the rental sector with its ever-changing project demands, and datacentres with limited external space for power generation systems. Power Cube is also very robust and quiet with a power output that is normally associated with generators double its physical size. 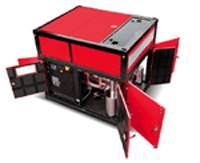 Compared to other 500kW generating sets, the Power Cube is 35% smaller with a 50% reduction in overall body length. Its exact dimensions are 2.991×2.43×2.59m (18.81m3 in volume). System size reduction has been achieved using a ‘V’ engine and a remote refrigeration system designed on top of the compartment. Power Cube can be transported in a 10foot container with a connection system that allows two generators to be shipped in a standard 20foot container. The Power Cube is ideal for enterprise and co-location datacentre installations looking to adopt a scalable approach to expansion of their facilities. A control unit allows up to 32 Power Cube units to be connected in parallel giving a size range of 500kW to 16MW. As a modular generating set solution, the advantages of operating Power Cube generators in parallel also scale linearly. Compared to a 1MW traditionally configured generating set, two Power Cube generators will produce lower emissions and noise and thanks to their higher operating efficiency, use less fuel. We were impressed by the Power Cube Generator and could see that Riello UPS are on the verge of stealing a real march on other UPS manufacturers offering traditional standby power generators. For a UPS specialist and datacentre solutions company like EcoPowerSupplies, the Power Cube ticks a number of boxes. It is innovative, solves specific datacentre power problems and helps to redefine the standard for an eco-friendly approach to standby power generators. We say ‘well done’ to Riello UPS and Himoinsa. We look forward to introducing our datacentre clients to the Power Cube as part of our critical power specialist solutions.